Hello pretty people, today I bring you something I haven’t brought to you in a while, a post about the world of beauty. The lovely folks over at The Natural Beauty Box sent me over their July box to have a look at and review, so that’s what I’m doing today. This box was sent to me for free, but this post is not sponsored and all opinions on the products are 100% my own. 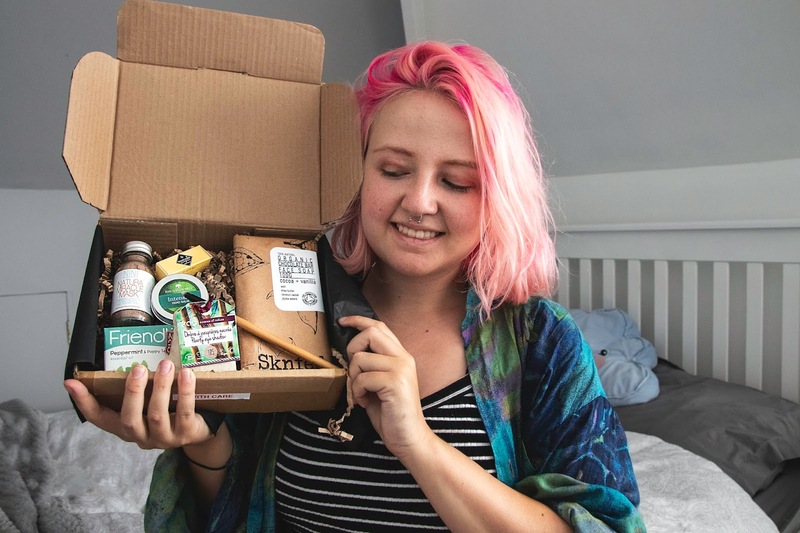 As it is #plasticfreejuly this month, the theme of July’s box was Zero waste beauty and so all of the products in this blog were free from plastic, and all of their packaging recyclable or reusable. 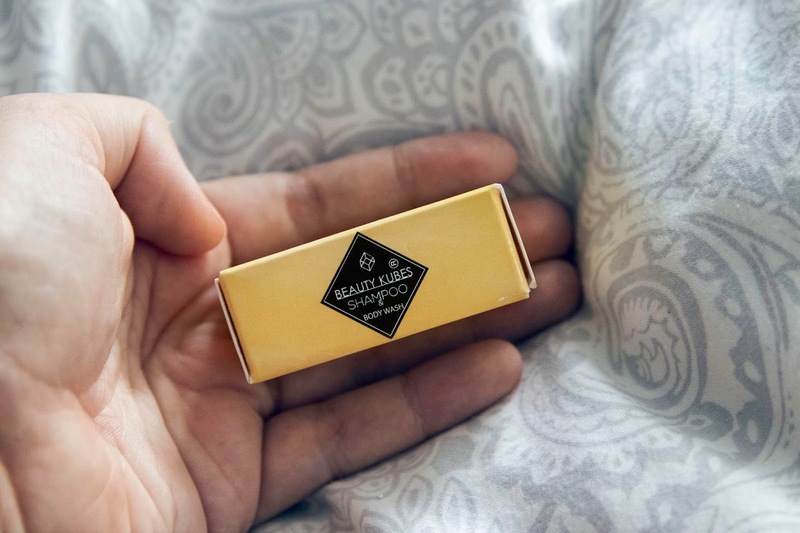 I’m really glad that I received this box because it’s made it clearer to me how possible it is to take plastic out of your beauty regime, and I always love finding new Ethically and Sustainably made products. So in this post I have a video with my first impressions opening the box, and then my opinions after using each of these products once. The box is a subscription service ar £24.95 a month (cheaper if you buy a longer plan) and in each box there are 5-6 items which total over £50 worth of product. Pretty good right? Let’s get into it then. Keep scrolling to see the full review! As with all of the products in this box, I’d never heard of Sknfed before this. 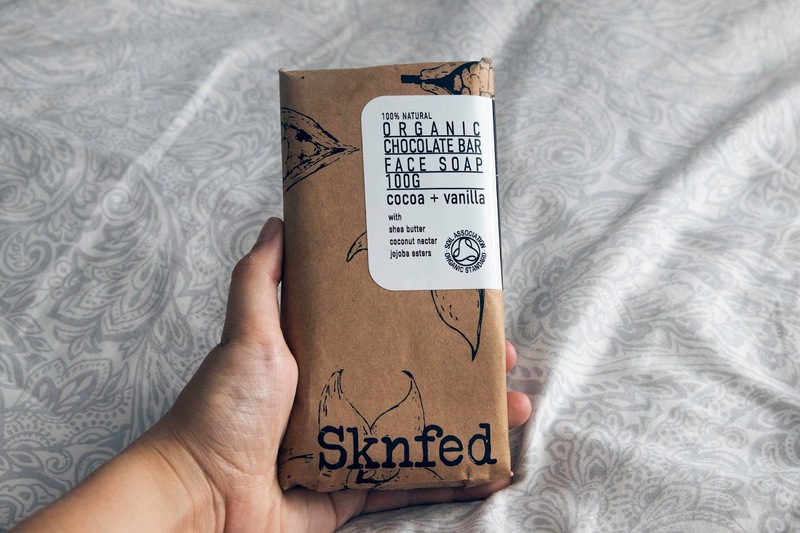 Sknfed are a Vegan skincare brand with products designed to feed your skin with natural ingredients. 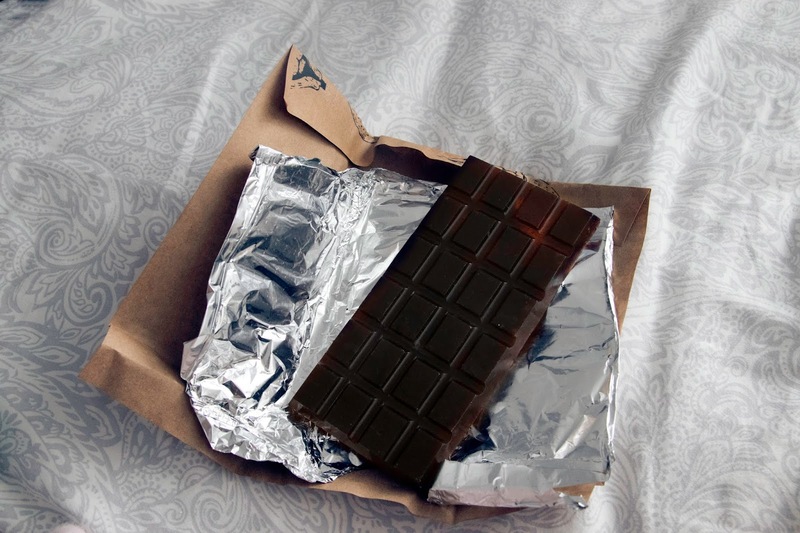 Their chocolate bar face soap really does look, and smell, like chocolate, and as it’s in little cubes it’s very easy to break one off to wash your face, from my usage I imagine one little square would last you 3 or 4 washes. And it means if you’re going away for a short trip where you don’t want to carry much, break off a chunk or two, wrap them up, and you have a tiny little package of face soap for your trip. Be careful not to get it confused with real chocolate though, I’m sure it’s relatively safe to eat but I don’t think it will taste nice. I found this to be really gentle on the skin, lightly cleansing, and I had no adverse reactions to it (a rare thing for my skin). Plus with it being packaged like your classic chocolate bar it’s all recyclable too. Now I’ll be honest here, I’m always a little skeptical of natural makeup brands because their products can often be a little naff, and they don’t usually have the colour ranges I look for in my makeup. But Zao have pleasantly surprised me. Although they don’t have a colour range that is all quite to my taste in makeup they do have a few more eyeshadow colours I’ve been looking for and their bamboo palette is exactly the kind of thing I’ve been wanting - plastic free, sustainably made, and it seems durable too. Almost all their product range is vegan, and labelled so. 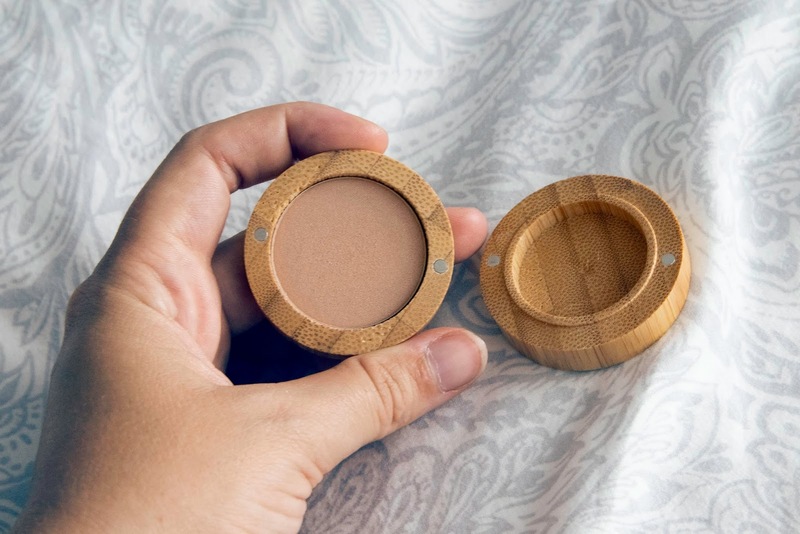 Onto the product in this box, their eyeshadow is packaged in a bamboo pot, and when you’ve hit pan you can simply remove the pan from it’s bamboo casing and buy a refill to go into it, just what I like from makeup, packaging you can use again and again. The colour of the Golden Sands eyeshadow is pretty much exactly the same colour as my skin, hance why there’s no swatch, and has a good glitter shimmer to it. For me it works for a good basic colour but could also work as a highlight colour for people with darker skin than mine. I couldn’t quite tell just how pigmented it was due to the colour being the same as my skin, but on the brush it picked up well and seemed to go onto my skin well too. I wore it all day, without primer, and could still see the shimmer at the end of it, so I’m impressed there. I think I might have to try a few moe Zao products, and maybe leave my skepticism of natural makeup ranged behind. I’ve had the same set of brushes for the last three years, they’re iridescent and purple but I never thought of what went into making them, just kept using them. Flawless, however, make vegan, cruelty free brushes. In this box was their diffusing brush, a type of brush I don’t use and so will probably get a lot of use out of. 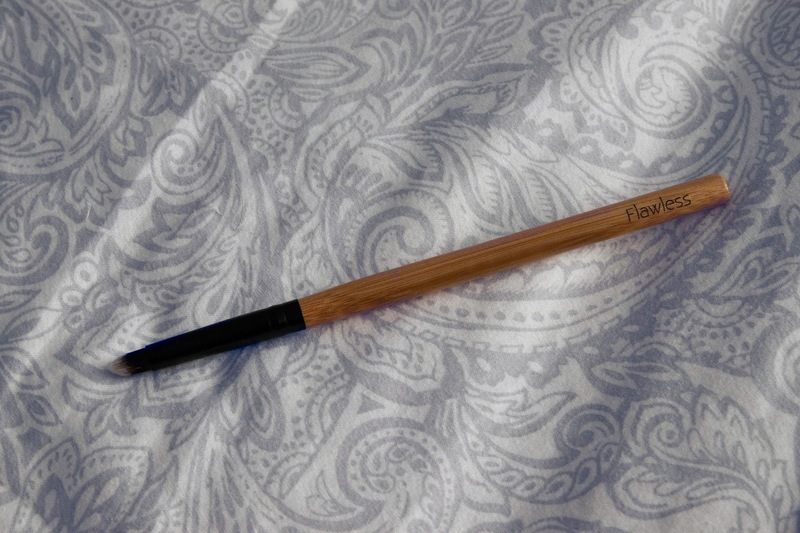 This brush is made with a sustainable bamboo handle, recycled aluminium ferrule and synthetic fibres; though I’m unsure as to what their fibres are made from. This brush was super soft, and picked up pigment well, though it’s designed as more as a blending brush. Flawless do also have a range of biodegradable glitter, but their festival chunky glitter does not appear to also be biodegradable. Plus as I talked about recently in a blog post it’s hard to know what biodegradable actually means a lot of the time. All in all a good brush, made sustainably and vegan, but I think that flawless need more information on their website about their sourcing and the materials in their products. NINI Organics make superfood for your skin with 100% natural and organic ingredients. They have a small range of products designed for different skin types and all of their range is cruelty free. Plus they have a big list of products they refuse to use in their products, making them a good place to go if you’re sensitive to a lot of conventional skin care. The Natura Miracle Mask is designed to be a “pollution solution”, to help gently clean, exfoliate and calm the skin. The mask smells very earthy, and though I’ve loved clay masks before I often have adverse reactions to them, not this time, apart from a little expected redness afterwards my skin just felt clean and fresh and ready to be moisturised. I’ve only used it once since receiving the box so can’t say it’s transformed my skin but it felt good and I will be using it again in the future. It’s designed for acne prone skin, which I don’t have, but it has some pretty good reviews on their site. Make sure to read the bottle properly though, I was struggling for ages to make the right consistency of mask until I realised it said “one tablespoon of powder to one teaspoon of liquid”, then it was the right texture. Also, due to the nature of the mask you can mix it in with all sorts of things naturally good for the skin from avocado or banana to almond milk or carrot juice, you can have a fun experiment with it, perfect for a pamper day. I think in future I might try it would coconut oil, as it was a little drying using it with just water but applying moisturiser after isn’t a problem either. 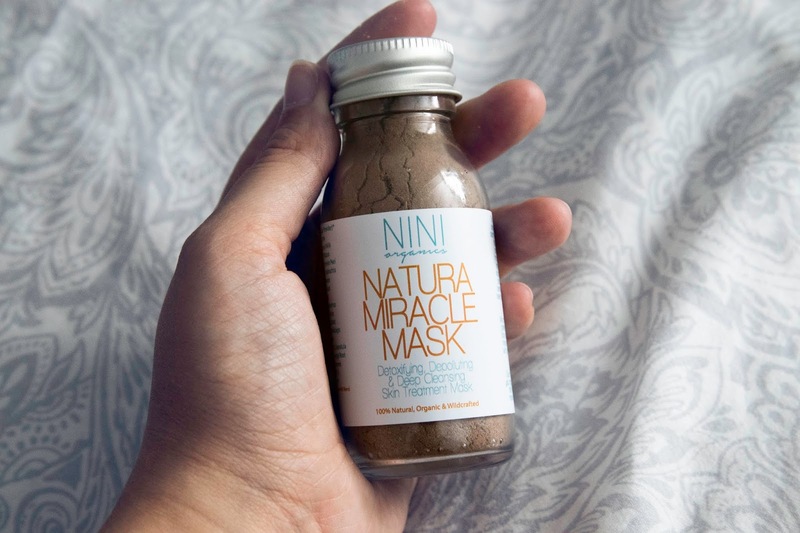 Only Zero waste, the mask is packaged in a glass bottle with a metal lid, like most of NINI Organics products, and so is wonderfully recyclable. And their products are all made by hand in the UK with ingredients mainly sourced in the UK, so ethically made too! 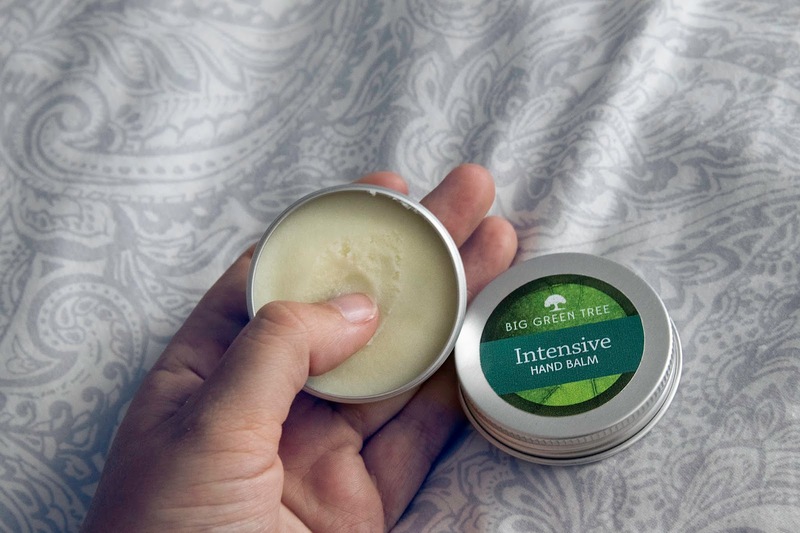 Big Green Tree is a UK based natural skincare company who manufacture their products by hand in the peak district. They have a range of skin and beauty products including a range of hand and foot care. I’ve never tried a hand balm before, but I think I now prefer it to hand creams. You only have to use a tiny abount and it leaves your hand a lot less slimy than most hand creams I’ve used. Plus you’re less likely to squeeze too much out. Not only that but there’s a lot less risk of it exploding in your bad and leaving a hand cream mess all over it. To me this hand scream smelt kind of sherbert like, sharp and fresh (though not like lemons). My mum said it smelt more medicinal, but either way I liked the smell. 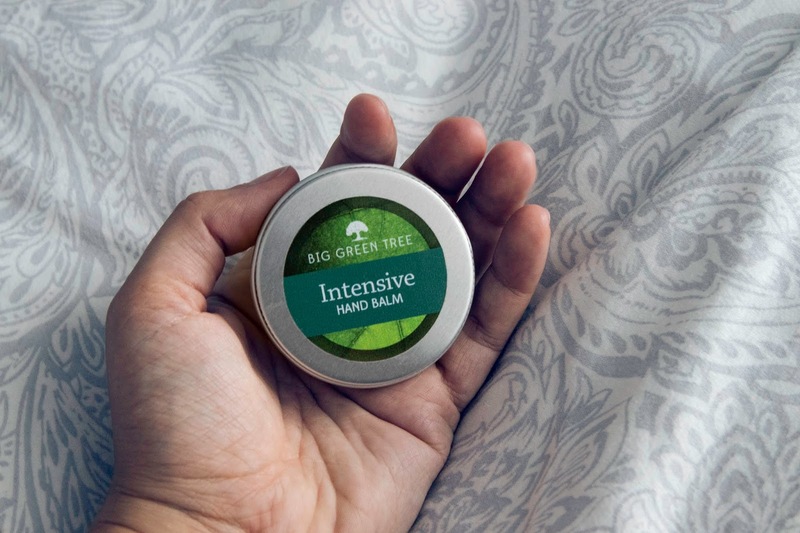 On their website Big Green Tree also say that this can be helpful for exzema and other conditions, but I don’t have eczema any more so can’t test this out for myself. But this will come in very handy when I’m back to climbing in October and I constantly have dry blistering hands. With it’s metal pot it’s also recyclable, and a good shape just to put in your hand bag, or in my case my climbing bag. 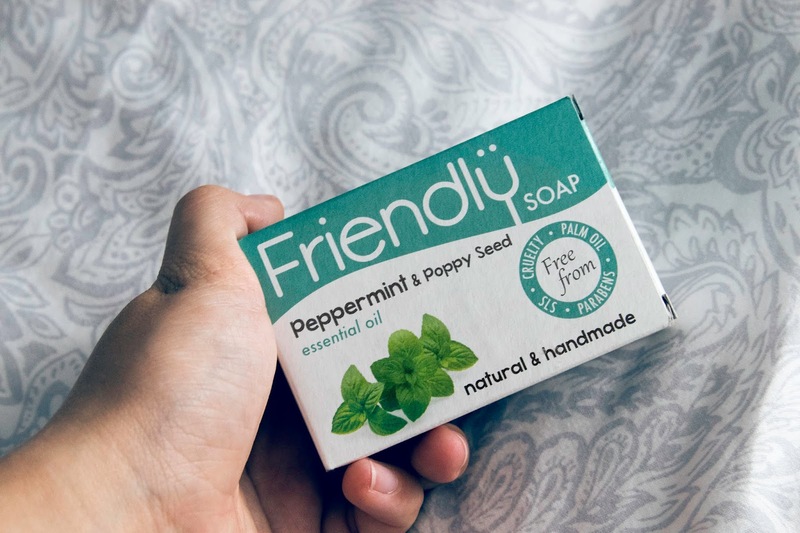 Friendly soap hand make a range of vegan soaps in the UK. 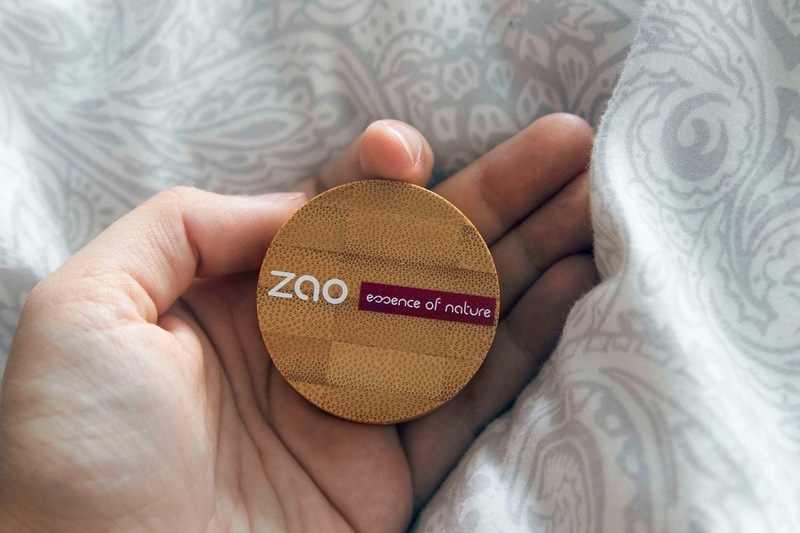 There’s zero by products, they’re biodegradable, and all of their packaging, including postage, is plastic free. The soaps themselves are packaged in recycled, recyclable cardboard and are a pretty good chunky size for the £2.11 you pay. I’m not usually a fan of most bar soaps because I find them to be quite drying on the skin but this soap was actually most moisturising than most and lathered well. Though I personally don’t enjoy the smell of this soap, it was more poppyseed than peppermint in smell, I’m keen to try others in their range, especially their lavender soap. Don’t worry though the soap won’t go to waste, I’ll leave it in the shower for my family to use. Last but not least we have the free sample in this box, which was hair and body wash kubes. This is something I’ve never seen before and I think is super cool, maybe my favourite product in this box. 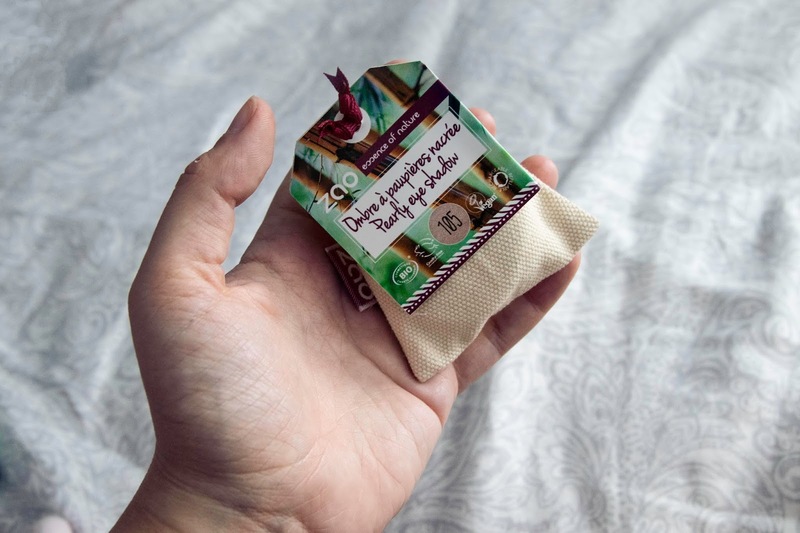 Kubes make plastic free toiletries in the form of their kubes of soap and shampoo, all made in Cornwall, all vegan and cruelty free. I was apprehensive taking this into the shower, I won’t like, but crumbling it up with some water was pretty easy and it lathered really nicely in my hair. It cleaned my hair much mor effectively than I expected too. One cube was a little too much for my short hair and I should've saved half to do some of my body, but I’ve learnt for next time. I think I prefer these to a lot of the shampoo bars I’ve used because of functionality, I find it much easier to crush these and lather them in my hair than trying to lather and use a larger shampoo bar, but I think shampoo bars are generally better value for money, though not more expensive than conventional shampoo. For me these would be ideal for travelling. 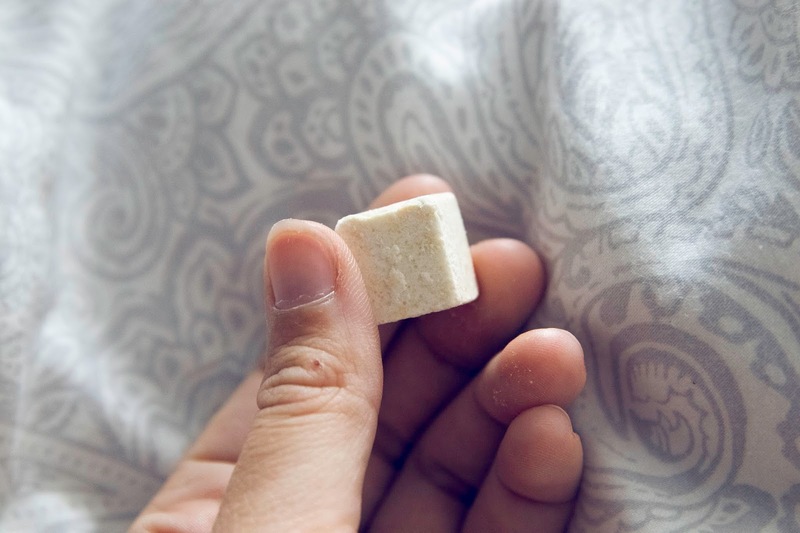 You bring a box of cubes with you and just take one in every time you shower, you can take just enough for your trip and don’t have to worry about taking stuff home again, or about that pesky hand luggage liquid limit if you’re flying. These specific cubes smelt wonderfully of lemon sherbet, but Kubes to a range including kubes for oily hair. And if you’re apprehensive you can get tester size boxes of cubes cheap to try out, I’d recommend giving them a go they’re super cool. So that’s it for this month’s The Natural Beauty Box, let me know what you think of it! And whether you’d like to see more beauty stuff from me in the future. To my great surprise i don’t actually seem to be allergic to any of the products in this box, hurrah! And I really enjoyed unboxing this and trying everything out, it definitely made my think of my not so plastic free or zero waste beauty regime and showed me that it is viable to go plastic free on beauty. So if you want to sign up and see what's in store for next month's The Natural beauty box go and subscribe!